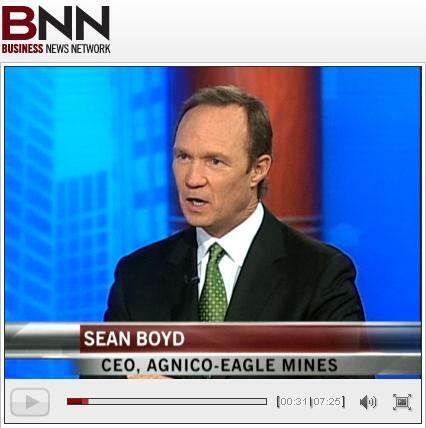 Agnico-Eagle Mines Limited (AEM) one of our favourite gold producers has seen its stock price trade in a lacklustre way recently, Sean Boyd, CEO, Agnico-Eagle explains the company’s mining projects and future prospects. The recent blip in the stock price is attributed to the fact that the Agnico have built and commissioned five new mines which has resulted in the capital expenditures of around two billion dollars over the last three years. This expenditure has hit the bottom line significantly, however, it now declines to a fraction of what it was, so hopefully we will see the dividends improve as the profits roll in. The acquisition of Comaplex should be all done and dusted shortly, enabling the company to concentrate on optimizing their mining operations to once again improve the bottom line and also to further explore and expand their properties. The cash costs are forecast to come in at $400/oz, so we have another reason to smile. Sean also notes that the EFTs have been outperforming the stocks of late, however, he expects that this situation is about to change in favour of the mining industry. This is something that we have wrestled with for some time as the HUI, for instance has not been offering the returns that we believe are necessary for taking such risks which are inherent in the mining industry. If you can find the time this clip is worth watching on BNN. Now, turning to our recent options trade on Agnico we made the purchase of the MAY 2010 series Call Options at a strike price of $60.00 on Agnico-Eagle Mines Limited, for which we paid a price of $4.64 per contract. These contracts are currently under water at the moment having closed today with the bid at $3.75 and the ask at $3.85 for a loss of around 19.00%. We made the purchase on the 11th February 2010 when Agnico-Eagle was trading at around $58.00 area, when we purchased both the stock and the Call Options. The stock has rallied a little and then fell back and rallied again to close at $62.79 today. We should note that these contracts expire on 22nd May 2010, so we really need to dispose of these contracts fairly soon. Today was a disappointment as both silver and gold prices trended up but the stocks did not respond. We will look to sell into the next rise hopefully at small profit, if not then will just have to take it on the chin and sell at a loss. 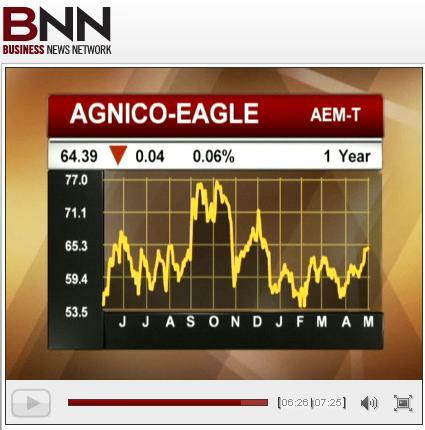 Agnico-Eagle Mines Limited trades on the NYSE under the ticker symbol of AEM and on the Toronto Stock Exchange under the symbol of AEM.TO. Agnico-Eagle has a market capitalization of $9.84 billion, a 52 week trading range of $43.29 - $74.00, an EPS of 0.54 and rather high P/E ratio of 116.08. Over on our sister site, silver-prices.net we have been rather fortunate to close both the $15.00 and the $16.00 options trade on Silver Wheaton Corporation, with both returning a little over 100% profit. Our premium options trading service, SK Options Trading, has closed the last 7 trades, with an average gain of 51.17% in an average of 37 days per trade, why not drop by and take a peak.